If you want to test your vocabulary, you can go to this website (click here). It’s a quick and easy test and lots of people have taken it. 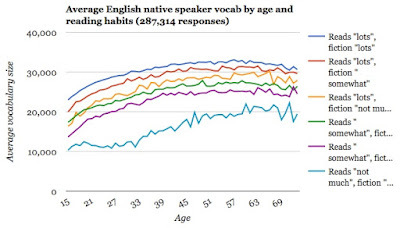 As a reader of OnFiction, you might like to go to the blog (click here) written by the people who run this test, who have graphed vocabulary scores of 287,314 people who had taken the test by May 2013 in relation to age and to the amount of fiction the test takers read. 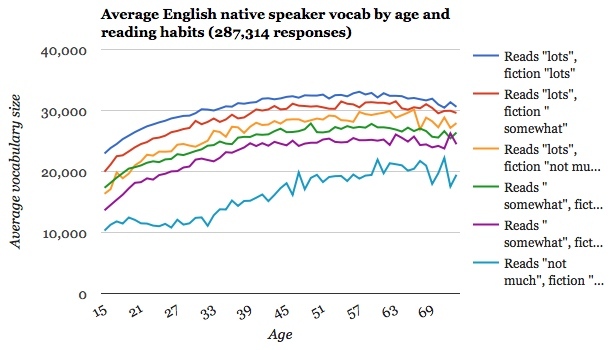 The results, shown in the figure above, are that the more fiction you read, the better is your vocabulary, that this effect has already started by the age of 15, and that your vocabulary score levels out by middle age. In the first half of life, the size of the vocabulary of people who read a lot of fiction is about twice that of people who read not much fiction. You might also like to know that the effect of reading fiction is not due to people who are more educated, or have higher IQ, liking to read more fiction. Research shows that it’s not. Research of this kind started with the very important work of Keith Stanovich, Richard West, and colleagues (e.g. Stanovich, West & Harrison, 1995) who did two very cunning things. First they conceived the Author Recognition Test, a list of names, some of which are of authors and some of which are not. You check the names you recognize as authors. Stanovich, West and their colleagues have shown that scores (numbers of authors’ names correctly checked) on this test give a very close proxy to the amounts of reading people do as measured by daily diaries, questionnaires and behavioural means. The second cunning thing Stanovich, West, et al., did was to take each outcome measure, such as vocabulary, and by means of a statistical technique called hierarchical regression, look to see the influence of everything that might affect it: age, IQ, level of education, gender and so on. The statistical technique allows one both to see the influence of each factor in turn, and then subtract out that influence. What they found was that after all the other influences had been subtracted out, the amount of reading people did predicted not only their vocabulary, but also other verbal abilities which include general knowledge, and verbal fluency. Recently, Raymond Mar and Marina Rain (2015) used a version of the Author Recognition Test (click here) which they had modified to separate the amount of fiction and non-fiction that people read. They found that the effects found by Stanovich, West, et al. including superior scores on vocabulary, were due not to the reading of expository non-fiction, but to reading fiction. So the result found by the testyourvocab group is solid. Why should this be? There are probably several reasons. One is that it’s in fiction, rather than in expository non-fiction that the fullest range of words in a language is to be found. Expository non-fiction often contains technical terms, but not most of the range of words in a language. Another reason is that many of the people who read fiction tend to read a lot, and in that way tend to come across more words than people who don’t read much, or who only read expository non-fiction. This effect may be especially true for people who read literary fiction. Mar, R. A., & Rain, M. (2015). Narrative fiction and expository nonfiction differentially predict verbal ability. Scientific Studies of Reading, 19, 419-433. Stanovich, K. E., West, R. F., & Harrison, M. R. (1995). Knowledge growth and maintenance across the life span: The role of print exposure. Developmental Psychology, 31, 811-826.